I have been creating videos since high school, so for quite a while now. As video turned digital so did I and since the beginning of this century I have been professionally creating computer animation. I still create video art as well, and combine computer animation with video. I have also been an educator for most of my adult life. I started out teaching sound at The Netherlands Film and Television Academy and am currently teaching animation at Monmouth University in New Jersey. My first real job was editing video for a news/documentary program called "Nova", which was broadcast on national television in the Netherlands. This daily program was provided longer and more in depth reports to complement the regular news broadcasts. I received my BFA from the Netherlands Film and Television Academy and my MFA in Art and Technology from The Ohio State University. Midori Kitagawa, my professor at Ohio State, handed out SIGGRAPH pins at one of the first student club meetings. The summer after that I went to the conference as a student volunteer. I only missed two conferences since. 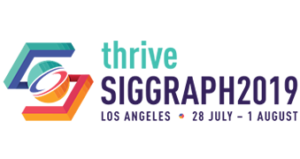 As for all regular SIGGRAPH attendees this is a tough question as there are so many great memories. To pick one: seeing (and hearing) John Dykstra give a talk. As the master of the original Star Wars effects, he is one of my childhood heroes and even though he claimed to be a newbie in computer animation when presenting his work on Stuart Little, his impressive VFX experience made the presentation really inspiring. Currently I am exploring new avenues of work under the general title "The Object of Animation", which among other things involves 3D printing. I have created the first physical object in a "Frozen Motion" series of 3D prints based on dance movements smeared out in time. I plan to create at least two more. The next step in the project is to use 3D printed objects in a visual music stop motion piece. Since he started as animator and directed some of my favorite movies, having diner with Terry Gilliam would be exiting. I would like to know how Quixotic he really is. And thank him for creating "The Fisher King"; I took my wife to be to see that movie on our first date. My first contact with the world behind the television screen was when our elementary school class participated in a gameshow where one had to run and stand on the spot corresponding to what you thought was the right answer to a multiple choice question. Stubbornly I did not follow the crowd and more than once stood alone (with a girl named Tine) on the wrong answer. I remember we had to re-run an answer because of a technical glitch; my first exposure to how reality is edited for TV. My film school teacher, boss, mentor and above all friend Jef Nassenstein is probably one of the most influential people in my life. Among the many things he taught me was an artistic view that looks beyond the traditional solutions.When, as a student, I was storyboarding a narrative video project, he suggested that I put the camera person with camera on a motorcycle and have him drive past the scene to get a more exciting shot. Not advice I followed but the unconventional approach to filmmaking stuck. I am happy that now that he is creating artwork using 3D computer animation techniques, I can occasionally teach him a trick or two. As mentioned it was Midori Kitagawa, currently at the University of Texas at Dallas, who first got me involved. But Rick Barry was the one who really got me sucked into the ACM SIGGRAPH vortex. Through him I became involved in the Education Committee and our local NYC chapter. His recent untimely passing was a great loss, to me personally and to the community. As animator, getting my student animation "Don't Pull the Plug" shown in the SIGGRAPH '99 Art Gallery was definitely one of the proudest moments of my career. As educator, it was a special moment to see an animation created by my students and me open the NYC student animation festival MetroCAF when I was chairing it in 2009. Animations are created to reach an audience and I am always happy when they succeed in doing so.